Hummus is a favorite of ours and its so easy to make. Why go out and buy such expensive containers of it when you can make it on the cheap at home? Check out our favorite and least expensive version of hummus that we know will have you hooked! Add all ingredients to your food processor and blend away! Add salt to taste and extra water if needed to smooth out the mixture. You can also get creative and add different items to change the flavor, like sundried tomatoes or pine nuts! Garnish with tomatoes, extra chick peas, or a sprinkle of cumin. Are you a hummus fan?! Homemade hummus is so much better. I haven't made any in awhile, I should do this soon! Right?! I agree, homemade hummus is delish! Same here! This one is Tahini free too because lets be honest....who usually has that laying around the house?! I do like hummus, this sounds really good! YUM! 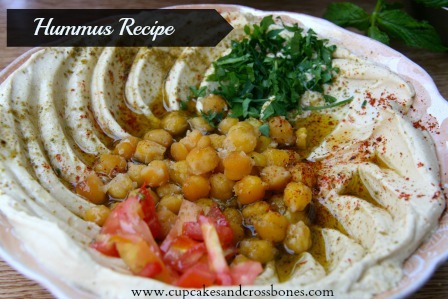 I've never thought of making homemade hummus.. this looks DELISH! That's a great idea! I love extra spice too! We love making hummus at home!! So much cheaper and actually we like the taste better! We are major hummus fans and can't wait to try this. Thanks love! You got it! We know you'll love it! Haha let us know what you think!